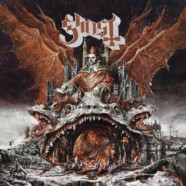 Ghost’s critically acclaimed fourth sacred psalm Prequelle has debuted at #3 on the Billboard Top 200 Albums chart, #2 Top Current Album, #1 Rock, and #2 Vinyl, with 65,653 albums sold. Prequelle also debuted at #1 in Sweden, Norway, and Finland, #1 at Rock in the UK, and in the Top 10 overall in the UK, Germany (#2), France (#4), Australia, and Mexico. This follows over 25,000 album pre-orders (the highest in their career), over 5 Million pre-release streams of first single “Rats”, and the announcement of their first ever headline arena dates. “Rats” is currently #4 at Active Rock Radio, and was the #1 National Rock Song of the Week (Music Choice). Additionally, Ghost today announced a massive North American fall tour including their previously announced headline arena dates at The Forum in Los Angeles, CA and Barclays Center in Brooklyn, NY that will kick off on November 1 in Chicago, IL and wrap on December 15 in Brooklyn, NY. Pre-sale tickets for the tour will be available beginning June 12 at 10:00am local time and general tickets will be available to the public beginning June 15 at 10:00 am local time HERE. VIP packages will be available HERE. A complete list of upcoming live dates can be found below. Released on June 1, Prequelle is available digitally and physically via Loma Vista Recordings nowHERE. Limited edition merch bundles are available exclusively in the Ghost Shop HERE. Ghost is currently featured on five collectible covers of Revolver Magazine’s June/July issue, which is available now HERE. Read the story online HERE. On June 14, Ghost will join legendary metal band Candlemass to honor Metallica by performing one of their songs as members Lars Ulrich and Robert Trujillo are presented with the Polar Music Prize by the King of Sweden, Carl XVI Gustaf.